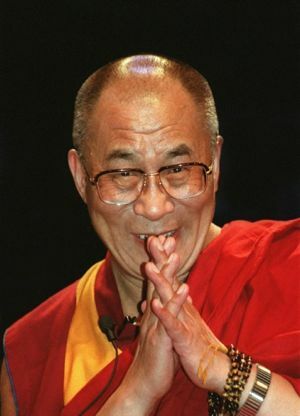 Here are some famous Dalai Lama quotes from the current Dalai Lama or Kundun as he is called in Tibet, Tenzin Gyatso. The Dalai Lama quotations here are from books by the Dalai Lama, interviews, and Dalai Lama Teachings. Please enjoy and share with your friends! *My religion is very simple. My religion is kindness. *Love and compassion are necessities, not luxuries. Without them humanity cannot survive. *Whether one believes in a religion or not, and whether one believes in rebirth or not, there isn't anyone who doesn't appreciate kindness and compassion. *If you want others to be happy, practice compassion. If you want to be happy, practice compassion. *Old friends pass away, new friends appear. It is just like the days. An old day passes, a new day arrives. The important thing is to make it meaningful: a meaningful friend - or a meaningful day. *The ultimate authority must always rest with the individual's own reason and critical analysis. *Our prime purpose in this life is to help others. And if you can't help them, at least don't hurt them. *This is my simple religion. There is no need for temples; no need for complicated philosophy. Our own brain, our own heart is our temple; the philosophy is kindness. *Be kind whenever possible. It is always possible. *If you can, help others; if you cannot do that, at least do not harm them. *There is no need for temples, no need for complicated philosophies. My brain and my heart are my temples; my philosophy is kindness. *It is necessary to help others, not only in our prayers, but in our daily lives. If we find we cannot help others, the least we can do is to desist from harming them. *The purpose of our lives is to be happy. *Happiness is not something ready made. It comes from your own actions. *We can never obtain peace in the outer world until we make peace with ourselves. *Where ignorance is our master, there is no possibility of real peace. *The roots of all goodness lie in the soil of appreciation for goodness. *It is very important to generate a good attitude, a good heart, as much as possible. From this, happiness in both the short term and the long term for both yourself and others will come. *We can live without religion and meditation, but we cannot survive without human affection. *Today, more than ever before, life must be characterized by a sense of Universal responsibility, not only nation to nation and human to human, but also human to other forms of life. *With realization of one's own potential and self-confidence in one's ability, one can build a better world. *I find hope in the darkest of days, and focus in the brightest. I do not judge the universe. *Sometimes one creates a dynamic impression by saying something, and sometimes one creates as significant an impression by remaining silent. Read the beautiful 'Aspiration Prayer of Mahamudra' by the third Karmapa.